He and another wrote, essentially, that one should bring one’s political message to any group of people who will listen to it. They’re both wrong, and for essentially the same reason that it would be wrong for an advocate of individual freedom to give a pro-freedom speech to a get-together of self-identified libertarians (i.e., anti-government types). I have no objection to speaking to anyONE. I do object to speaking anyWHERE. The context matters. If I were invited – as I have been – to address a group of people who believe that achieving freedom requires lawmakers/government to put unreality on-par with reality; that it requires putting faith on-par with reason; that it requires putting altruism on-par with rational egoism; that it requires putting “the greatest good for the greatest number” (utilitarianism) on par with the defence of each person’s control over his own life, liberty, and property…if I – AS A PROPONENT OF FREEDOM – were to address a group defined by the need to make those equivocations as THE MEANS to achieve freedom, I would thereby be telling the world that that group’s philosophy of equivocation makes them pro-freedom…that would be the explanation for why I was talking to them…that would be the implicit message, which they would most certainly make explicit: “Freedom advocate Paul McKeever today spoke before our pro-freedom group”. That would be the take-home message. And it would be both a farce and a betrayal of those who actually do want freedom, because freedom cannot be achieved by a government that is not committed to making decisions solely on reality, by way of reason, in defence of each individual’s pursuit of his/her own happiness, by way of defending his/her control over his/her own life, liberty, and property. It can’t be done with a governmental philosophy that makes laws that serve unreality, irrationality, altruism, or tyranny. There is no religion – not one – that rejects the unreal, that rejects the irrational, that rejects the altruistic, and that rejects tyranny. Not one. All of them admit such things as supernatural realms, faith-based knowledge, self-sacrifice, or obedience to the alleged commandments (e.g., sharia) a magic man in the sky. Almost all of them tell people that this life is just a stepping stone to an after-life, or a reincarnation, or what have you. Few, if any, say: “This life is the only one you get, so you’d better make it count”. The most destructive result of believing that a better life awaits you beyond the grave is that you end up living THIS life in the ways you believe will get you to that wonderful afterlife…an afterlife that, more often than not, promises to be an eternal, effortless, bliss. Dangle that carrot in front of a man, and he’ll do almost anything to himself or to his neighbour to get it…especially if he’s feeling miserable in this life, on this earth. Now, all of that stuff – the belief in a supernatural realm or afterlife, taking things on faith, sacrificing of oneself for others, etc. – is harmless if one restricts it to one’s personal life, and does not impose it on others. If a guy wants to drink gasoline, all the power to him, so long as he doesn’t thereafter walk into a school with a match. But law-makers are those whose entire purpose is to impose rules on OTHERS. They are those who – as politicians – promise (either with words, or with winks, or by hanging out with people to suggest that “I’m on your team”) to make and enforce laws. That’s ALL they do as legislators and governors. That’s their job. So if a law-maker comes into (or, in the case of Brown, actually HOSTS) a religious function, and he is doing it for electoral purposes, he is not just talking to individuals and making them feel included in the party or political process. He is also offering himself up be used by the very purpose that brings those people together on that occasion. He’s not just saying: You’re welcome in the political process and in my party. He’s also saying: that which brings you together here today is welcome in the political process, and in my party, and in the law-making process, and in the law. 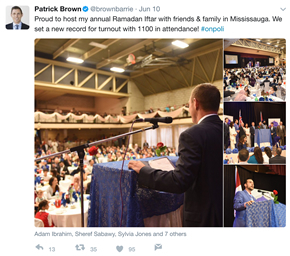 When Patrick Brown schmoozes with people who are gathered together for a religious purpose, he is saying that that purpose is one that will be included by him and respected by him in the course of making laws and governing. Because there’s no such thing as a religion committed to reality, reason, rational selfishness, and consent, by saying that religious purposes are to be respected in the course of lawmaking and governing, one is saying that unreality, irrationality, altruism, and/or tyranny are to be included and respected in the course of law-making and governing. Brown knows it. Brown is counting on his 1100 religious celebrators to believe it. He’s not saying merely: “Hey Joe, you’re alright with me.” He’s saying “Hey Joe, you’re religion has a place in the law-making process and in governance”. In short, he is saying: “Don’t worry, I’m not going to defend your neighbour’s freedom from the oppressive measures your religion would have me impose on him”. Moreover, let’s not drop the context of Brown’s reported effort. The religion he’s signaling to is Islam. If anyone bothers to read the Quran – as I have – he will learn that Islam recognizes only ONE law-maker: Allah. It recognizes only ONE set of laws: those made by Allah, which are called “Sharia”. Sharia is, essentially, the Islamic 10 Commandments. It is for this reason that those who practice Islam with the greatest fidelity are those who oppose the making of laws by Man, for Man…which we call “democracy”. There is absolutely NO WAY that an advocate of democracy can also be an advocate of theocracy – the two are diametrically opposed. Either government serves the governed, or it serves Allah. Either Man makes laws or Allah does. Either the law serves Man’s purposes (in this life, on this earth), or it serves Allah’s. There is no logical way to straddle Democacy and anti-Democracy, and there is no way to straddle Theocracy and anti-Theocracy. Brown is pretending there is. Either he’s an ignorant fool, or he is giving away the defence of freedom in exchange for an MPP’s salary.